Sharon Thomas of West Ohio has been living with AIDS for 18 years. WASHINGTON (UMNS) — Sharon Thomas, vivacious and funny, appears to be the picture of health. You might not think of her contagious smile when you put a face on the HIV/AIDS pandemic. But there she is, living with AIDS for 18 years. Thomas is one of 1.2 million people living with HIV/AIDS across the United States. Twenty-seven percent of them are older than 50. People in the United States are living longer with AIDS due to the antiretroviral medications available, known as cocktails. The 40 million across the globe living with the HIV/AIDS virus, the majority in sub-Saharan Africa, are not as likely to have access to the pharmaceutical cocktails to extend their lives. Thomas, the vice chairperson of the board of directors of the West Ohio AIDS Ministries Committee, was one of more than 150 United Methodists from all over the United States to network, strategize, and energize one another for the continuing fight against HIV/AIDS during a Sept. 8-9 conference in Washington. 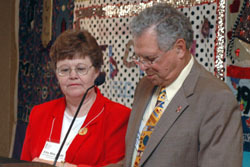 Bishop Fritz Mutti and his wife, Etta Mae, speak at the "Lighten the Burden" conference. “Our immediate response is to put the fire out, but sometimes we cannot douse the fire,” he said. “If you really want to fight a forest fire, you have to have forest fighters trained, an organizational structure in place and a system that prevents the fire,” said Dr. Thomas. He lifted up the revitalized United Methodist hospitals in Asia and Africa as such a system. In particular, Dr. Thomas praised the United Methodist Church’s Chicuque Hospital in Mozambique, under the leadership of Bishop João Machado, another speaker at the conference. The last conference for United Methodists on HIV/AIDS was held 20 years ago in San Francisco. “We’re not going to drop the ball this time,” said the Rev. Donald Messer, director of the Center for the Church and Global AIDS Fund. 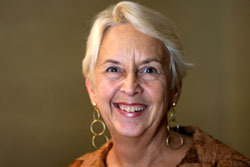 *Coudal is a staff writer for the United Methodist Board of Global Ministries. News media contact: Kathy L. Gilbert, Nashville, Tenn., (615) 742-5470 or newsdesk@umcom.org. Musa Dube: We cannot afford to not have a policy. Musa Dube: The problem is within us. Editors and other church communications leaders–get articles, graphics, and syndications tools, etc.